Ceramic needles suitable for addressing the elution and abrasion problem of metals. Direct sapphire bonding technology makes hollow transparent cells a reality. Direct bonding of sapphire and alumina without adhesives. Highly rigid and extremely thin with reduced weight. High-purity alumina setters are ideal for quality improvement and cost reduction. High-strength substrates compatible with direct-bonding of copper sheets are suitable for a wide range of power module applications. Kyocera high-precision ceramic technology supports sensors for a wide range of pressure conditions. Ultra thin, enabling devices to become smaller in size, lower in height. Monolithic ceramic structure with no bonding material for long-term reliability. Ceramic Insulator Tubes are used in vacuum interrupters for medium voltage switch gear (approx. 6kV to 80kV). Possibility of 50% size reduction, with 1.6 times higher voltage resistance than conventional ceramic (based on Kyocera simulation). Used for air heating and air drying. Substrates suitable for high-precision processing. Kyocera produces alumina substrates with superior reliability for use in thick film applications. Intricately shaped products made using our advanced press and extrusion forming technologies. Kyocera offers a variety of open tool coaxial connectors made with our proprietary ceramic-to-metal bonding technology. Thin film substrates with excellent surface smoothness. Faucet valves feature excellent wear-resistance and sealing performance. Kyocera provides the most commonly used ceramic-to-metal bonded feedthroughs. Protection tube for thermocouples offers excellent corrosion-resistance and high temperature strength. Excellent surface flatness and smoothness with fewer surface defects. Used at synchrotron radiation facilities and to support various other accelerators. Spacers for glass disks in Hard Disk Drives (HDDs). ESD-safe tweezers developed to handle elements sensitive to electrostatic breakdown. Ceramics are used in various textile machines as guide parts, thread processing nozzles, oiling nozzles, rollers and twister parts. The high dielectric constant and Q value contribute to the downsizing of resonators. Kyocera's isolator flanges support Large Helical Device (LHD) equipment used in nuclear fusion experiments. Ceramic tools and fixtures contribute to advanced precision of Hard Disk Drive (HDD) heads. Ceramics feature excellent wear-resistance for use in cleaner cones, suction box covers, blades, flat parts and rollers. SiC heat exchanger tubes feature excellent heat- and corrosion-resistance and high thermal conductivity. High-dielectric ceramic substrate with excellent temperature coefficient (Tf). Kyocera's high-precision machining technologies and diverse materials enhance manufacturing productivity. 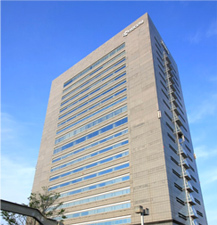 Kyocera provides sapphire windows with superior ultra-high vacuum properties. A variety of materials are available for diverse property and frequency requirements. Kyocera provides SiN (SN287) RF windows for gyrotrons and klystrons. Excellent oxidation-resistance and high temperature strength extend lifetime of welding tools. Used by many LED manufacturers as substrates for LED crystal growth. Excellent thermal shock resistance enables hardening depth stability. Used in decorative pieces for luxury goods, such as watches, for its deep color and rich look. High rigidity and chemical resistance maintain surface shape over long periods of time. Insulators for medical and electrosurgical endoscopy devices. Proven effective in top high-energy physics projects worldwide. Used as SOS substrates for their excellent material properties and mass-producibility. Polishing plate with higher thermal conductivity and lower thermal expansion. Used in a variety of semiconductor processing equipment parts for plasma and heat resistance. Silicon nitride features excellent thermal stability, thermal shock resistance, mechanical strength and corrosion resistance. Used in a variety of semiconductor processing equipment parts for its plasma- and heat-resistance. Excellent plasma resistance increases the lifetime of parts. Excellent anti-wear properties with optional microspikes. Electrical insulators for X-ray tubes and RF windows. Produces large structural parts with excellent rigidity and precision. High purity and excellent plasma resistance increases the lifetime of parts. Transportation parts with high purity and excellent chemical resistance. Various surface shapes available for diverse operational conditions. High purity, excellent plasma resistance and de-chucking response suitable for a wide range of temperatures. Utilizes sapphire's excellent light transmittance and thermal conductivity. High purity with excellent plasma resistance and thermal uniformity. Utilizes excellent light transmittance and hardness of sapphire. Vacuum adsorption chucking type; various coatings are available. Parts to obtain specific amounts of liquid. Parts that function as a valve to switch between mobile phases and sample solutions. Utilizes the excellent light transmittance and hardness of sapphire. Pump parts to obtain specific amounts of liquid. Support substrates used for liquid drug-delivery systems. Utilizes sapphire's excellent light transmittance and hardness. Utilizes the excellent light transmittance and chemical resistance of sapphire. Utilizes the excellent infrared ray transmittance and heat resistance of sapphire. Utilizes the excellent light transmittance, heat resistance and insulating properties of sapphire. Parts for liquid drug-delivery systems. Our specialists are available to answer any of your questions.